Beginning of Main St on entering Robe. Style and quality doesn't have to come with an exorbitant price tag. 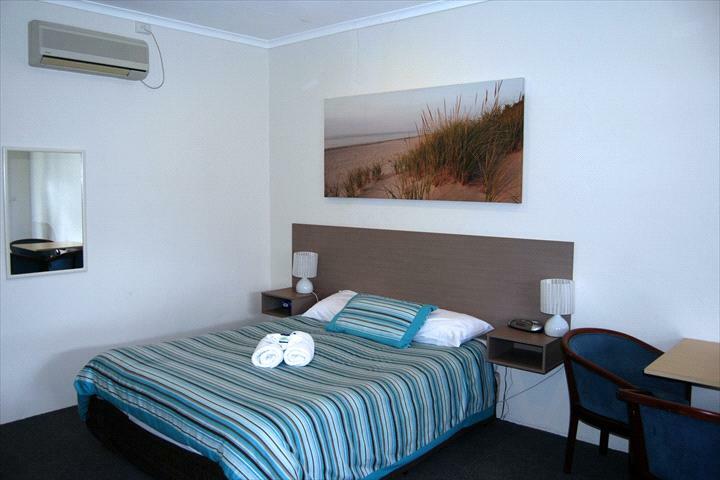 The Robetown Motor Inn & Apartments has a variety of family-friendly spacious motel rooms and apartments overlooking the beautiful township of Robe. All ground floor units, with reverse cycle air-conditioning and some with undercover car parking. All rooms & apartments have free Wi-Fi, flat screen LCD televisions, refrigerator, toaster, tea and coffee making facilities, iron & ironing board, and hair dryer. 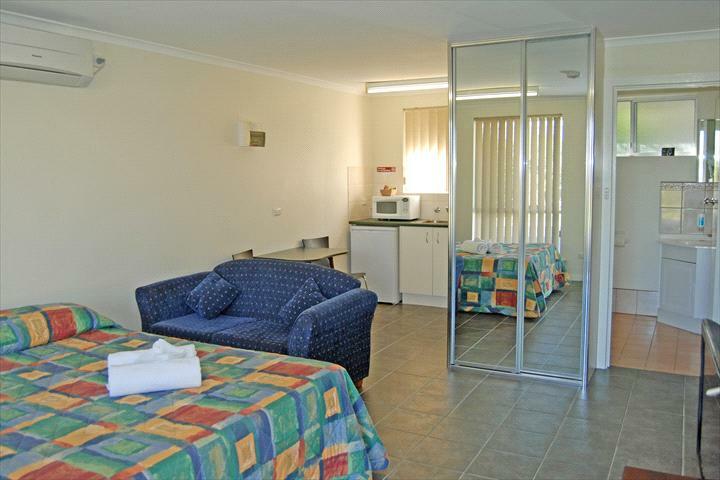 Motel rooms include free Austar movies and sport while apartments are complete with DVD player and free movie hire. Our 2 and 3 bedroom apartments offer a full kitchen with electric cooktop, oven, and sink; while our 1 bedroom apartments feature a kitchenette with electric frypan. 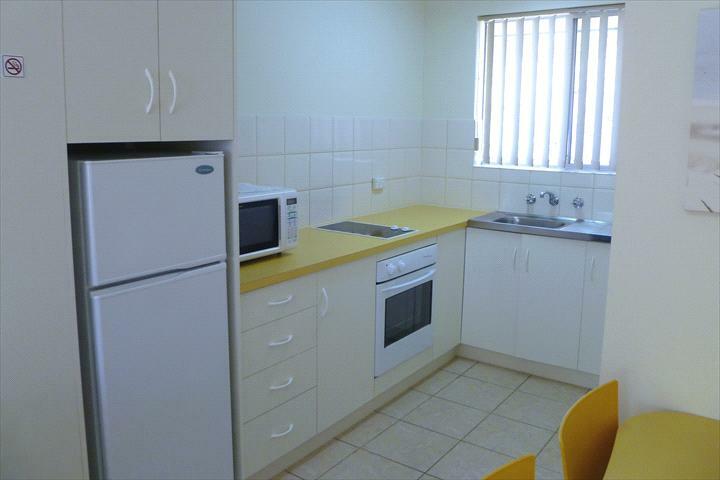 All apartments are equipped with microwave and all crockery & cutlery needs. A luxurious indoor heated swimming pool and separate heated spa and a modern indoor barbecue area with all facilities for large or small groups are available for all guests at no charge. 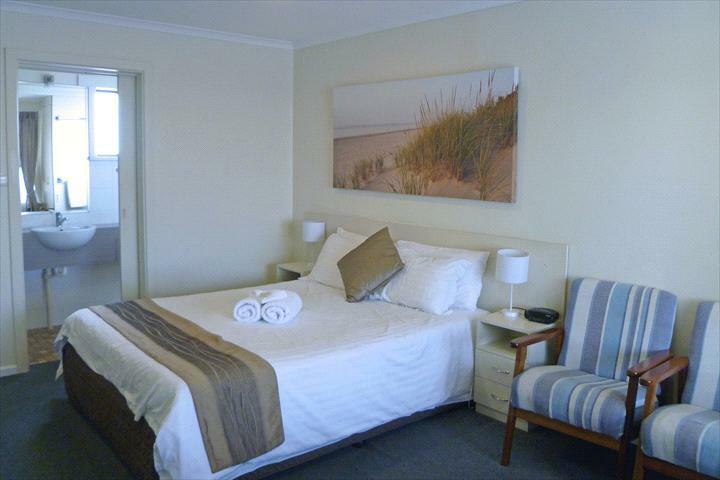 Robetown Motor Inn and Apartments is only metres from the local supermarket and just a short stroll to beaches, the town centre shopping, hotels, restaurants, arts & crafts, boat harbour, walking trails and historical buildings. Surf, swim, ski, fish, play golf or just take in the picturesque village of Robe. But what you will love most about Robetown Motor Inn are the prices - we consistently prove that style and quality doesn't have to come with an exorbitant price tag - we can provide quality accommodation for a little as $110 a single and $120 per double (off peak) and family accommodation for 2 adults and 2 children from as little as $150 per night. Two-Bedroom Apartment features large open-plan living area with sofa, dining table & chairs, flat panel TV, DVD, free Wi-Fi, full kitchen with oven, cooktop, sink, microwave, mid size refrigerator and all utensils. Separate bathroom with shower & vanity, one large double bedroom with queen size bed and one bedroom with two single beds and second TV. Sleeps four. Free guest access to indoor heated pool and spa plus modern indoor BBQ / kitchen with all facilities. . Apartment has off street parking and access to a communal coin operated washing machine & dryer. Three-Bedroom Apartment features large open-plan living area with sofa, dining table & chairs, flat panel TV, DVD, free Wi-Fi, full kitchen with oven, cooktop, sink, microwave, mid size refrigerator and all utensils. Separate bathroom with shower & vanity, two large double bedrooms with queen size beds and one bedroom with two single beds. Sleeps six. Free guest access to indoor heated pool and spa plus modern indoor BBQ / kitchen with all facilities. Apartment interconnects with adjacent One Room Apartment enabling up to 8 guests to stay in comfort & privacy. Apartment has off street parking and access to a communal coin operated washing machine & dryer. 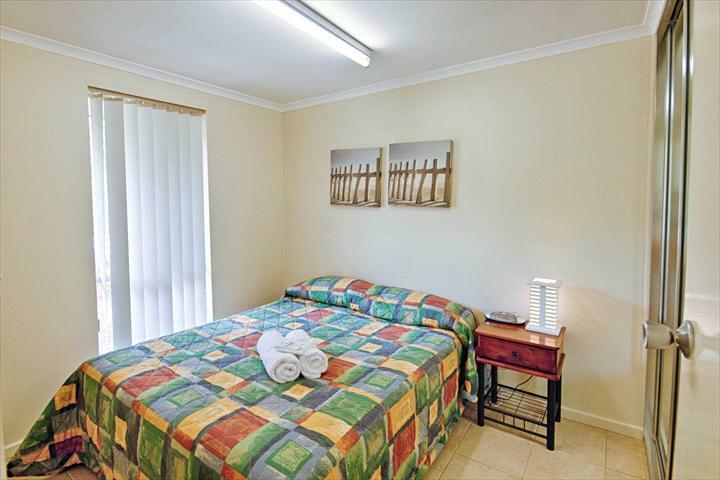 Family Room with queen bed and two single beds, ensuite bathroom with shower & vanity, hair dryer, iron and ironing board. Flat panel TV, free satellite channels, DVD, free Wi-Fi, seating area, a toaster and tea/coffee making facilities and reverse cycle air conditioning. Access to guest laundry, indoor heated pool and spa plus modern indoor BBQ / kitchen with all facilities. Cot available upon request. 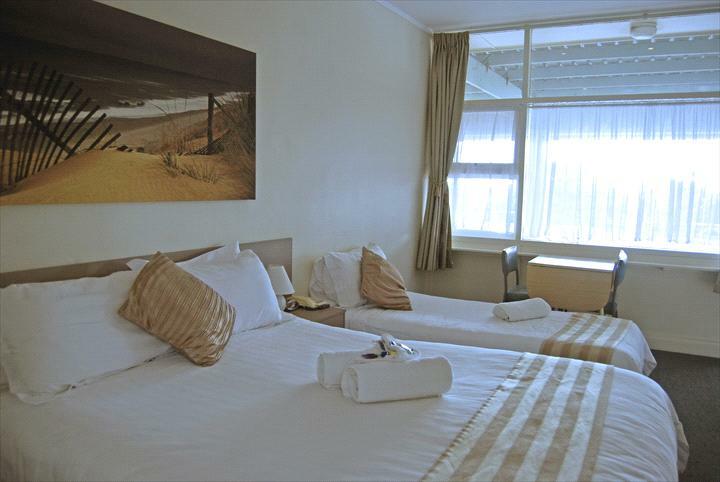 Queen Room features one large double (queen size) bed, ensuite bathroom with shower & vanity, hair dryer, iron and ironing board. Flat panel TV, free satellite channels, DVD, free Wi-Fi, seating area, a toaster and tea/coffee making facilities and reverse cycle air conditioning. Access to guest laundry, indoor heated pool and spa plus modern indoor BBQ / kitchen with all facilities. Cot available upon request. One-Bedroom Studio Apartment features large open-plan living area with one large double (queen size) bed, sofa, dining table & chairs, flat panel TV, DVD, free Wi-Fi, kitchenette with basic cooking facilities (microwave, electric fry pan, sink and small refrigerator), separate bathroom with shower & vanity. Sleeps two. Access to indoor heated pool and spa plus modern indoor guest BBQ / kitchen with all facilities. Interconnects with adjacent 3 bedroom Apartment enabling up to 8 guests to stay in comfort & privacy. Apartment has off street parking and access to a communal coin operated washing machine & dryer. 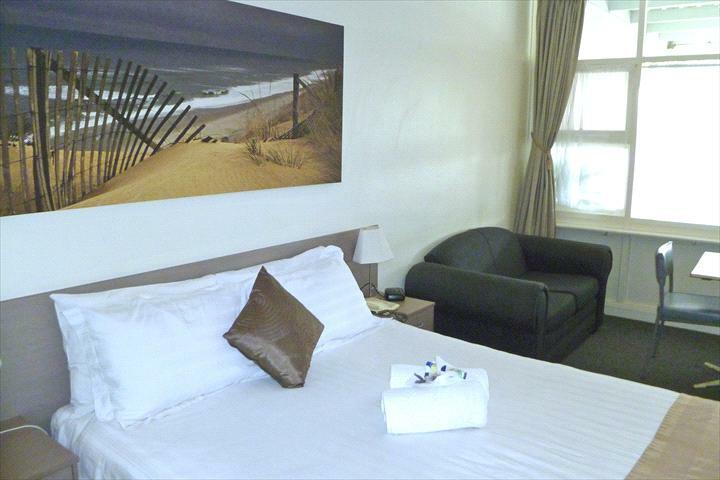 Twin Room features one large double (queen size) bed and one single bed, ensuite bathroom with shower & vanity, hair dryer, iron and ironing board. Flat panel TV, free satellite channels, DVD, free Wi-Fi, seating area, a toaster and tea/coffee making facilities and reverse cycle air conditioning. Access to guest laundry, indoor heated pool and spa plus modern indoor BBQ / kitchen with all facilities. Cot available upon request. Two Room Family Suite features one room with a queen bed, flat panel TV, free satellite channels, DVD, free Wi-Fi, separate bathroom, seating area, a toaster and tea/coffee making facilities, and a separate bedroom with one bunk bed, one single bed and a second TV. Reverse cycle air conditioning, access to guest laundry, indoor heated pool and spa plus modern indoor BBQ / kitchen with all facilities.Cot available upon request. 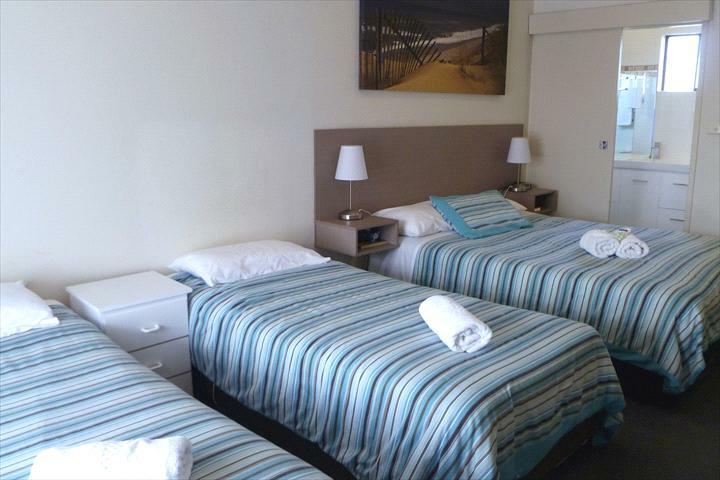 Two Room Family Suite features one room with a queen bed, flat panel TV, free satellite channels, DVD, free Wi-Fi, separate bathroom, seating area, a toaster and tea/coffee making facilities, and a separate bedroom with two single beds and a second TV. Reverse cycle air conditioning, access to guest laundry, indoor heated pool and spa plus modern indoor BBQ / kitchen with all facilities.Cot available upon request. Please note we only hold your credit card details as security and you can pay when you check in. Robetown Motor Inn will not charge you any reservation fees for making this booking. We have a 14 day cancellation policy during peak holiday periods and 48 hour period at other times.